PACEY is a strong advocate for childminders and we want to share the amazing work that they do plus support childminders along the way. Together, this information makes up #childcarechampions and #notababysitter. A movement towards the celebration of childminding and combating common myths. Get involved in the conversation on our Twitter or Facebook using the hashtags. If you are a new childminder, looking to get into the childcare sector and nurture the next generation, find all the information you'll need in our childminder section. Still wondering why childminders work in early years? Here are five more reasons. Need some great examples of amazing childminders? Look no further. Maisie Poppins is a home-based childcarer who focuses her business on the development of children, working hard to maintain a balance between the EYFS and child led play. You'll also the parents' point of view, about why they love using a home-based setting. Lastly, meet Myra, a registered childminder in Wales who changed her career to follow her passion for childcare. Here she talks about why she loves her job so much. Meet the rest of our childminders and read their stories. Do you think that childminders are just glorified babysitters who drink tea all day, or put children in front of the television instead of creating constructive activities? You couldn't be more wrong. 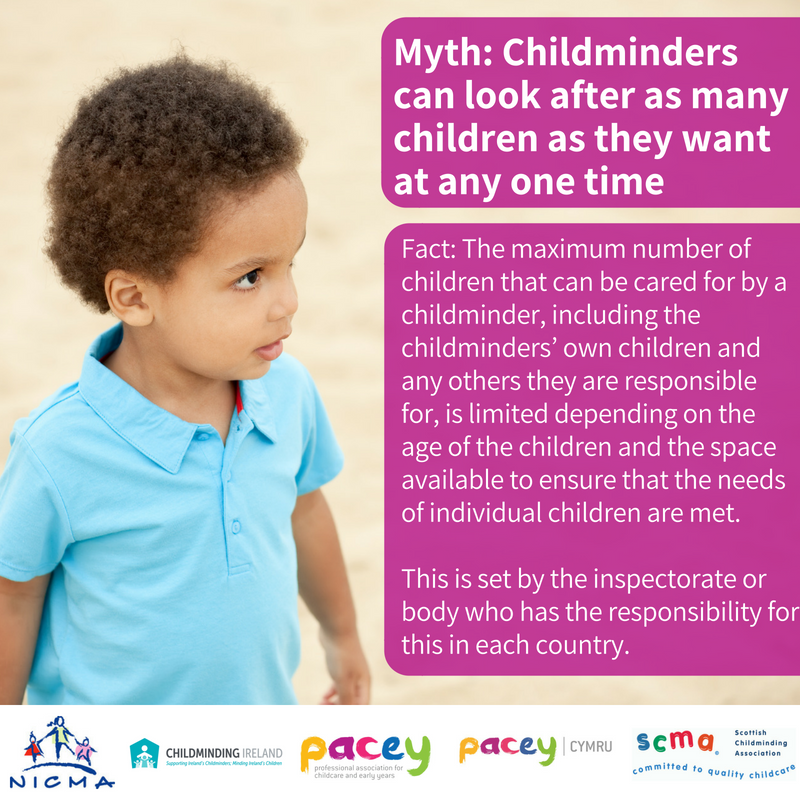 PACEY has two campaigns running to combat common myths about childminders towards both parents and professionals. Our latest campaign, #notababysitter has been created to tackle one very common myth that parents think; that childminders are just babysitters. Download our media pack and graphics. This campaign aims to reach parents across the country, starting within local authorities who are part of our Together for Twos project in England and continuing wider. Along with a social media campaign, there are opportunities for printed materials to be in children centres, libraries, GP surgeries and more. If you are a local authority who would like to support this campaign and are interested in a media pack and personalised printed materials, please contact us. One of our most popular blogs from 2017, was about childminder myths in England. In 2018, we extended it to the whole of the UK. Created with PACEY Cymru, the Scottish Childminding Association (SCMA), the Northern Ireland Childminding Association (NICMA) and Childminding Ireland we have refreshed our myths and given you the facts from around the UK and Ireland. The campaign aims to highlight the essential work that professional childminders deliver whilst busting myths and promoting key facts about their childcare services. Fact: The maximum number of children that can be cared for by a childminder, including the childminders' own children and any others they are responsible for, is limited depending on the age of the children and the space available to ensure that the needs of individual children are met. This is set by the inspectorate or body who has the responsibility for this in each country. Download this myth and share the facts using #childcarechampions. Fact: Although the childcare and early years sector as a whole is dominated by women, an increasing number of men are choosing to become childminders. Many of these are fathers who see childminding as a career option that allows them a better work-life balance and the chance to be their own boss. Many families value male childminders as positive male role models for their children and it is not uncommon to see couples working as co-childminders. 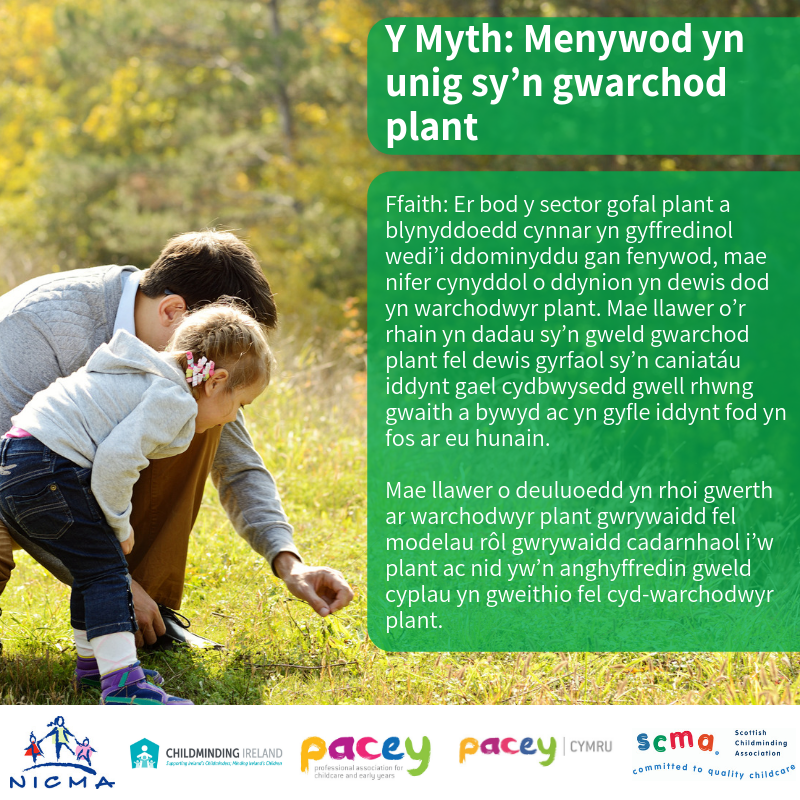 For the welsh version of this myth, download here. 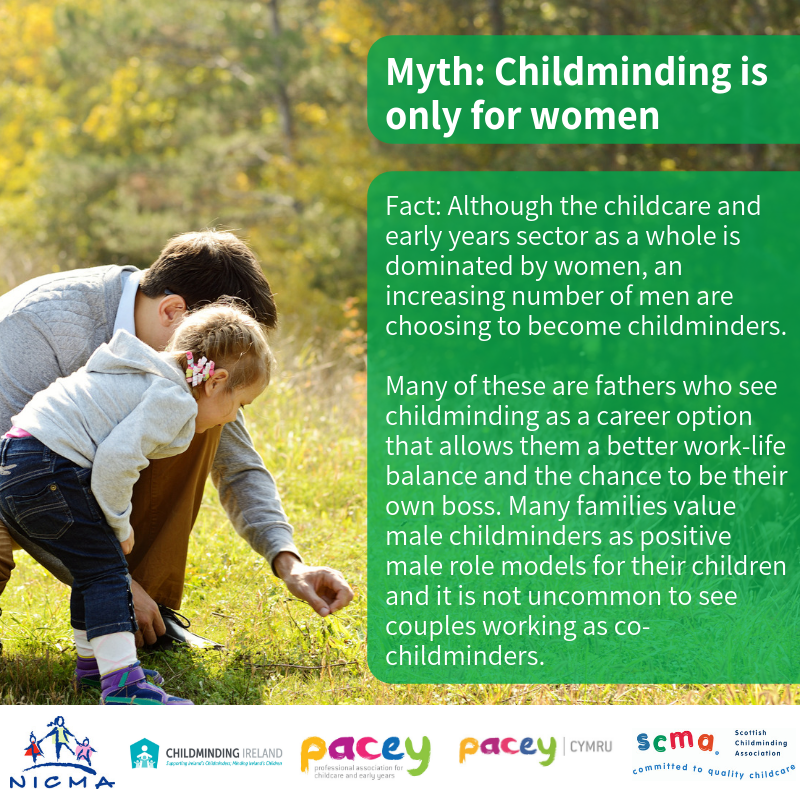 Read all the childminding myths and get involved with the campaign. Childcarers in England are, from Septmeber, able to offer up to 30 hours free childcare per week to parents. This new government initiative hasn't been without its challenges, however, and we're here to help childminders and other providers make the best decisions for their business. We've also been active in the media, helping represent our members' interests. Do you agree? Get involved in the conversation on our Twitter or Facebook channels using the hashtag #childcarechampions and #notababysitter.